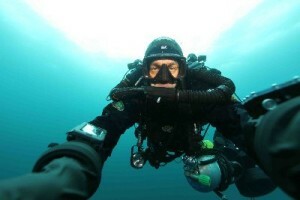 Through his own specialist company, Rich is able to provide support and equipment for any underwater location. Rich owns and can supply all the modern format cameras and underwater housings, including the exciting new Epix X and Scarlet digital cinema cameras. Alongside the Red cameras DMS own and operate HD and HDV camera systems such as Sony EX1r, Canon 5D Mk2/3 and POV cam systems such as the Panasonic HMK10. Beyond the cameras themselves, Rich provides in water camera operators, safety divers, surface supervisors, light operators and all diving activity is communicated through surface to diver communications, even in the open sea.Any underwater location can be safely dived and filmed and Richard’s team have been responsible for managing and executing top drawer productions the world over, in particular the more challenging environments such as polar ice and flooded caves. All UK underwater operations are governed by the HSE, and as such DMS are a registered HSE Media contractor and hold insurance for both public and employers liability. In addition the company is listed as a BBC and ITV Approved Diving contractor, and references can be provided upon request.